We love to help people create special memories by catering parties and events and even though we’ve been doing it for so long now it never gets boring as every single day is different. We’ve provided the food for hundreds of wedding receptions, birthdays, engagements, corporate events, christenings and so much more and we’d be hard pressed to think of an occasion we haven’t catered yet. Whatever your celebration, announcement, party or business event, we can cook you a delicious hog or spit roast using one of our own machines. You may not know this but we designed them ourselves and manufacture them in the north of England. We have a range of several machines for both professional and domestic cooks, so even if you want to cook for your family at home, for everyday mealtimes or even just for special occasions, you can hire or even buy one of our machines to do it yourself. One of our repeat customers, Steve, has hired our machines 7 times in total now. 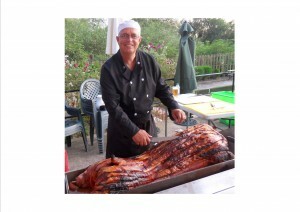 He’s cooked both hog and spit roasts for his family and friends, mainly for birthdays and summer barbecues, but this time he called us to ask us to cater his 50th birthday party with a Hog Roast In Hazelbank. This would be our first time catering for him but from knowing him for several years now, we knew without asking that he would want our pig in a bun special for his big day. If you’re not sure what that is, it’s just what it sounds like – the pork made into sandwiches using bread rolls – but in addition to the soft, floured buns and the juicy meat slices, we add pieces of freshly roasted crackling, our homemade stuffing and tangy apple sauce. There could be no other way to make a pig in a bun in our eyes! We arrived at Steve’s house on Wednesday afternoon to prepare for an evening service and cooked the hog for a few hours until it was perfectly moist on the inside and golden and crispy on the outside. Even though Steve knows how to cook this way himself, he loved our hog roast and wanted to know our secret to the great taste. We’ve been doing it for such a long time that I guess it’s simply second nature to produce such delicious food now!